LG posted record quarterly profit and sales in its second-quarter results announced today, a development some analysts believe will make it the world's third-largest handset vendor. Total second-quarter 2008 net income at the firm surged 84 percent to SKW706.9 billion (US$691 million), from SKW384.6 billion (US$376 million) a year earlier. Sales during the quarter rose 22.5 percent to SKW7.23 trillion (US$7.1 billion), from SKW5.9 trillion (US$5.8 billion) a year earlier. Mobile handset sales advanced 45 percent to 27.7 million units shipped, led by its high-end 'Voyager,' 'Viewty' and 'Venus' models. The vendor said it sold 7 million touchscreen devices during the period, at an average selling price of US$530. Profit at the mobile phone division, which accounted for 38 percent of revenue last year, doubled to SKW547.3 billion (US$535 million), on handset sales of SKW3.75 trillion (US$3.7 billion). 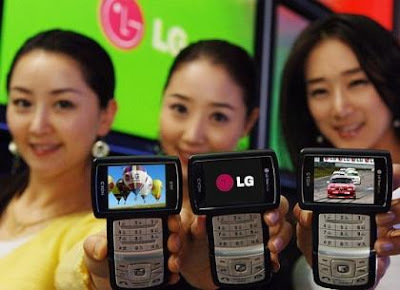 An International Herald Tribune report notes that some analysts, including Goldman Sachs, believe LG probably moved past Motorola in market share during the second-quarter to seize the number three position behind Nokia and Samsung. Nokia last week reported earnings and revenue that exceeded analysts' estimates though profits dropped by 60% and forecast that industry shipments this year may surpass its previous projection of about 10 percent growth. Meanwhile, number-five vendor Sony Ericsson Friday said second-quarter profit fell because of declining sales of higher-priced handsets and product delays. The company plans to cut about 2,000 jobs as a result. Second-placed Samsung is scheduled to report results this Friday.